Ancient Celtic mythology and religion revolved around the wheel of the Celtic year - a lunar-based calendar with eight segments, each with a corresponding festival. The four fire festivals, all including bonfires, take place on the last evening of a month and the following day and are tied to the agricultural cycle: Samhain is celebrated on October 31-November 1 (Halloween) and marks the Celtic New Year. Imbolc is celebrated February 1-2 and welcomes spring (Groundhog Day). Beltane (Bealtunn in Scots Gaelic, meaning May Day) is celebrated April 30-May 1. The god Bel (or Cernunnos, the horned god of Ireland) dies but is reborn as the goddess' son. He then impregnates her ensuring the neverending cycle of rebirth. Lughnasadh (Lammas in England) is the feast of the god Lugh and the first fruits of the harvest and is celebrated August 31-September 1. The other four holidays of the Celtic year celebrate the spring and fall equinoxes and the winter and summer solstices. Alban Arthuan (Light of Arthur), like winter solstice celebrations all over the world, celebrates the return of the sun following the shortest day in the year. The spring (vernal) equinox is celebrated as Alban Eiler (Light of the Earth). Alban Heruin (Light of the Shore) is celebrated as Midsummer's Day. Finally, Alban Elued (Light of the Water) is observed at the autumn equinox and, like the spring equinox, is a sacred time when the line between worlds is thin and magical possibilities abound. 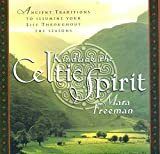 From Amazon's review: "Following the format of the Celtic calendar, Freeman shares the stories, recipes, spells, and Gaelic expressions that go with each of the monthly festivals and celebrations." This is a truly lovely book, packed with engagingly shared information and beautifully illustrated. From the Author: "The content within The Mist-Filled Path represents an amalgam of personal experiences I have had; initiatory experiences that have opened me to the deeper flow of energy in the universe, and an expansive vision for an integrative human spirituality that celebrates the living earth. Although partially rooted in the ancient cosmologies of my Scottish Highland and Irish ancestors, I have written The Mist-Filled Path from a broader, interfaith, ecumenical, and integrative perspective." This book has rave reviews from readers. A wonderful introduction to modern Celtic spirituality. This is a terrific, well-researched look at the history and customs of the British holidays - where did they come from, why are they celebrated as they are. Useful for pagans, or for anyone interested in British history or for all of us who love holidays and traditions. Book Description: "From the twelve days of Christmas to the Spring traditions of Valentine, Shrovetide, and Easter eggs, through May Day revels and Midsummer fires, and on to the waning of the year, Harvest Home, and Hallowe'en; Ronald Hutton takes us on a fascinating journey through the ritual year in Britain." Caitlin and John Matthews are world-renowned Celtic scholars, folklorists and practicing pagans. You will find many of their books scattered about our website. In this book, Caitlin has provided short meditations for each day of the year drawn from Celtic pagan spirituality. A reader in Celtic culture, both prose and poetry, from pre-Christian times to the present. Lovely illustrations by Australian calligrapher Lynne Muir. Dr. De Paor is an award-winning modern Irish poet writing in Gaelic, a professor of Irish Studies at the National University of Ireland in Galway, and a proponent of Irish cultural revival. Asala gathered traditional Celtic recipes, then grouped them by holiday with meal planning tips for a complete feast, including drinks. Sprinkles folklore stories and tidbits throughout. A nice cookbook whether you're pagan or not and easy way to begin creating your own Celtic celebrations. Llewellyn is the only publisher so far to offer a complete series of books on all eight Celtic holidays. While some of these books are quite good, for example Midsummer by Anna Franklin, readers must use discernment. Each book discusses the pagan roots and traditions, and also provides recipes, crafts, and other celebratory ideas. Llewellyn also offers Wheel of the Year: Living the Magical Life - by Pauline Campanelli (with very nice illustrations by Dan Campanelli) - this is a lovely, up close and personal look at how their family celebrates the Celtic year. Highly recommended. For lots of great articles and information on the Celtic Myths, visit Celtic Mythology.